Have you ever felt like you have little or no control over what's happening in your life? Are you scattered, unfocused, and anxious? Are you having a hard time discerning what is good about your life, and changing what isn't working for you? I struggle with these things from time to time myself. Actually, I struggle with them to some extent on a daily basis. I just don't talk about them, mainly because I don't want to admit to anything that will make me seem vulnerable or weak. I'd rather you see the part of me that is open, confident, and supportive of my friends and my community. Because I can't drive I always feel like Spashionista isn't able to do justice to all of the designers and events that go on in Nashville. My to-do list is usually scrawled on the back of an envelope - and I have yet to check off a list before I either add to it or give up on it entirely. It's hard for me to not get discouraged when I can see my motor skills diminishing over time. When typing a sentence takes 5 minutes because my fingers can't hit the correct keys. When it takes three times as long for me to cook a simple dinner than it did a year ago. It's difficult to maintain focus and motivation to exercise and eat right when Cerebral Palsy and aging make my muscles quiver like taut rubber bands and my silhouette becomes rounder every day. Despite these things my life is good and I have a lot to be happy about and grateful for. The trick - the art - of life is to focus on the positive and choose those things that make your life manageable and joyous. Not an easy task, but my friend Kimberly Montgomery has created a tool to help us see the big picture. It's called the Choices Notebook. 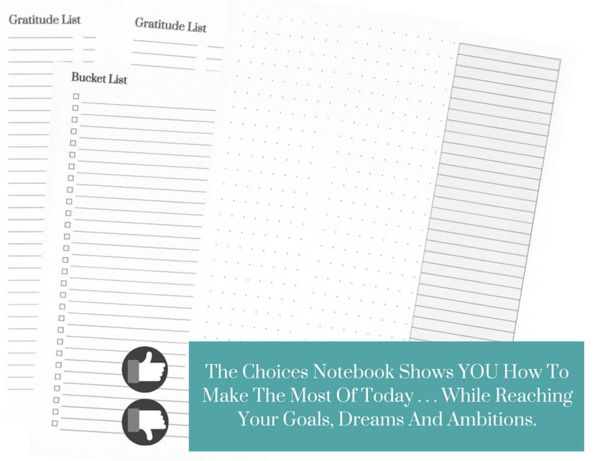 The Choices Notebook will help you on the path to your goals while reminding you of the proven happiness markers that will keep you both satisfied with your current life while on the path to your future goals - because happiness is essential for success. A good notebook is crucial for any busy lifestyle. It's your companion in accomplishing goals, tasks, taking notes from business meetings, drawing ideas, brainstorming, and to keep life moving forward. It's nice to have everything in one place and be able to have access to it anywhere and anytime. The premise is to work towards your goals while promoting the principles of true happiness. Using the 192 pages to plan your months, days and year, you’ll learn to break your goals into more manageable steps and remind yourself of the actions you need to take each and every day to achieve more and to bring happiness in your life. In addition to traditional planning tools you'll find a "Gratitude List", a "Bucket List", and blank pages for notes and ideas. The Choices Notebook is available for pre-order now and will begin shipping on December 1st - just in time for holiday gift-giving!